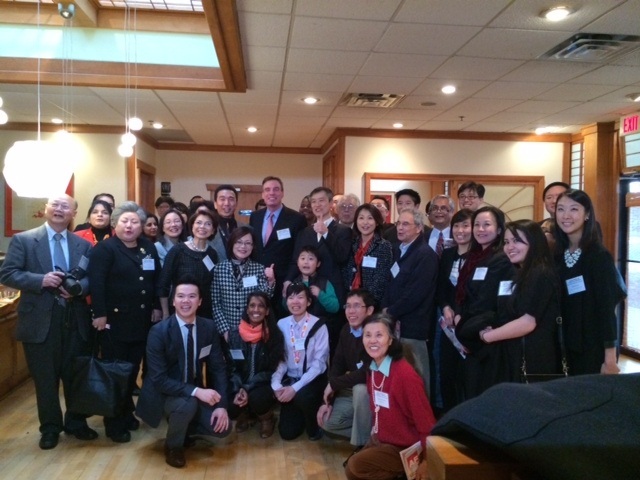 Mark Warner came to our community to hear what we have issues to the government and want to solve the problems of current situation as a gridlock in the aspect of politics in the Capital Hall to Pan-Asian community in the Northern Virginia where the most population of Asian live. 마크 워너 상원의원(민주당)이 현재 당면한 정부의 과제들을 해결하는데 도움을 얻고자 북 버지니아 지역에 살고 있는 많은 아시안 대표들을 만나기 위해서 왔다. This special event hosted by a Council of Herndon, Grace Han Wolf and CKA (President, Sam Yoon, Council of Korean American) to the people who are so-called Asian as an identity in common. 이번의 이벤트는 CKA( 회장, Sam Yoon) 의 주관으로 헌돈의 시의원인 그레이스 울프 한이 주최하고 지역사회의 아시안들이 아시안이라는 공통 분모로 참석한 가운데 챈틀리의 한 레스토랑( 미카쿠) 에서 열렸다. Sen. Warner brought some specific issues that we encounter as obstacles in our work a day life such as: Immigration reform, education, economy, small business and so on. 워너 상원의원은 최근 문제로 대두되고 있는우리 삶에서 뗄레야 뗄 수 없는이민법 개정, 교육, 경제, 그리고 소 상인 등 현재 국회를 달구는 뜨거운 이슈들을 가지고 해결하기 위해 주민들의 입을 통해 해결책을 찾고 그 방안을 모색하고 자 왔다. Sen. Warner said to audience in his introduction of speech, he was the first governor who admitted to sell the“SoJu”, the liquor produced by Korea to the State of Virginia for liquor lovers when he served as Governor of Virginia (2002-2006). As a Governor, He managed deficit to surplus and created a lot of jobs (at least 135,000 jobs) in Virginia to become the best State for business, the best managed State during in his term. He talked about the current atmosphere in the Capitol Hill and White House dealing with all the problems related with money as a financial committee. He works as a committee of Senate banking, Budget, Commerce, and Intelligence committees. 마크 워너상원의원은 인사말에서 자신이 버지니아 주지사였을때 가장 먼저 한국“소주” 를 많은 버지니아 주민들이 마실 수 있도록 판매 승인을 해 준 최초의 주지사라고 설명할때 많은 이들의 웃음을 자아내기도 했다. 마크 워너가 주지사였을때, 그는 주의 예산에 있어 적자운영을 흑자로 변환시키는 데 기여한 주지사 였으며 주 예산을 가장 효율적으로 잘 운영한 주, 가장 사업하기 좋은 주였으며, 정당간에 있어서도 모든 사안들을 가장 잘 조율해서 최대의 효율성을 가져오기도 한 주지사였다. 그는 그의 재임기간동안(2002-2006), 적어도 135,000개의 일자리를 창출한 주지사기도 하다. 현재 국회와 백악관과의 첨예한 긴장관계, 즉 경제와 관련해 이를 완화, 또는 문제 해결을 위해서 그가 맡은 재정의원의원의 역할을 잘 감당하고 있는 의원이기도 하다. 그후 그는 상원의원으로 상원 은행, 예산, 상공, 정보관리 위원으로 가장 주목받는 의원이다. Firstly, He introduced “The special day of 467 new immigrants who are came from 86 countries to become as a citizen of America is the today” to celebrate their transition as citizens. He talked about the immigration reform that its centrifugal force like a “ Hot Potato” in Capitol Hill right now after John A Boehner, of a Ohio ( The leader of House, GOP) said,” I never underestimated the difficulty that moving forward would be,” in his Thursday address on the Capitol Hill. 먼저, 첫번째 이슈였던 이민법 개정안에 대해서 “ 오늘 86개국에서 부터 온 467명의 이민자들이 미국 시민권을 딴 날” 이라고 말하며 축하 해야 하는 날이라고 말했다. 바로 전날 좐 뵈이너( 하원대표)의 이민법 개정안에 대한 국회에서의 부정적인 발언을 한 다음날이어서 그는 조심스레 언론(Press)을 의식하면서 입을 떼었다. He stated that as a Senator, he starts to act with positive effects (Cut deficit, Increase Opportunity, The Excellent source of improvement and development Technology and Economy) from the Immigration Reform. 부정적인 공화당의 이민법 개정에 대한 태클에 대해 긍정적인 대응 방안( 적자감액, 기회증진, 기술과 경제의 발전과 증진)을 시작할 것이라고 말했다. Secondly, He answered of the question by one of audiences about education that it needs to be updated and banned discrimination of admission in the major universities. He said “tests” for the students in VA is to be changed from the “thinking” to “Creative thinking”, and he confirmed to support to the “discrimination of admission” with fair shot to equal opportunity. 두번째로, 마크 워너 상원의원은 한 방청객의 교육시스템이 업그레이드 되어야 하고 또 그러기에 앞서 유명대학의 인종차별에 대한 문제가 개선되고 인종간의 형평성을 고려해서 차별입학 허용수치 인정을 폐지해야 하지 않느냐는 질문에 그는 말하길, 먼저 시험 유형이 바뀌어야 하는데 주로 생각해서 문제를 푸는 것에서 이젠 좀더 창의적인 사고를 할 수 있게 하는 형태로 발전되어야 하며, 차별 입학 허용제 에 대해서는 누구에게나 공평하게 대우 받을 수 있는 권리가 있다고 지지를 하겠다고 말했다. He mentioned the “student loan” as a burden as soon as graduation done to be fixed with “refinanced with lower rate” to give students more opportunities and freedom to grow. Thirdly, he stated that the economy part, as a role of Senator in 5 years of his office, that has had hard times to fix the debt and deficit instead of fighting each other between parties. He mentioned that “debt and deficit” did not fix and still 17 million dollar deficit. He said 95% of customers are in Asia and knowing of how to tie the Virginia asset to strengthening and increasing with the Free Trade in the international wise. 그리고 그는 학생들이 졸업과 동시에 대학을 나오면 벌써 빚더미에 안게 되어 옴짝 달싹을 못하는데 이런방안을 시정하고자 융자금을 낮은 이율로 재 융자 할 수 있는 방안을 모색중이며 이러한 일련의 방법들이 나중에 졸업을 해도 더 자유로운 생각과 함께 더 발전할 수 있는 기회를 제공하게 될 것이라고 말했다. Fourthly, as President Obama said in the State of Union, “Small business to be more supportive by the government with many ways to build the strong back born as a middle class in America”. One of audiences asked how to prevent “Fraud” in the business? He answered that from the question, “Insure business with insurance under the specific steps along with. He mentioned for the small business owners, easy to access to bank for lending money to continue increasing profit, use the internet to “Cloud funding” to assess capital to improve their business. 하는 방안과 함께 인터넷을 이용해서 자금마련을 할 수 있게 하는 방안을 모색중이다”. 라고 말했다. The Host of CKA is identity of non-partisans and non-profit organization that who run as a second generation to support next generation for the rights as citizen of America. 그런데 무엇보다도 중요한 것은 여러분들이 필요로 하고 꼭 바뀌길 원하는 법안들은 반드시 여러분이 뽑은 상. 하원 의원들이 결정한다는 것을 명심하고 자주 소통하여 무엇을 원하는 지, 무엇을 필요로 하는 지 하는 것등을 알리고 또 물어 볼 수 있도록 늘 가깝게 다가가라고 조언 했다. Lastly, the owner of the restaurant, Park, Hae Chan brought a bottle of Soju to hold up toward audiences to end the event. 끝으로 레스토랑의 주인인 박해찬 변호사의 소주가 등장하면서 소주를 들면서 그 날을 마무리 했다.